If She Wasn’t Hooked Before…She is Now! Big warm up the past few days. Temperatures in the 70s. Warm temperatures are supposed to continue through Wednesday. Wednesday night looks like chances of rain which will continue into Thursday which will bring a cool down. Mid 60s Thursday, low 50s Friday, but warming up Saturday and Sunday into the mid 60s. We have seen no generation since Wednesday and then they ran two generators for a while Wednesday night. Tomorrow’s projection shows the eqeuivalent of a low one generator all day. We really need this to clean some of the algae out of the river. Getting pretty “uckie” in places. Wonderful day on the water this past Saturday. Jim went out in the afternoon with Don and Ramona from Arkansas. Both are fairly new fly fishers and Jim worked with them on technique. they caught fish on the black zebra midge, the primrose & pearl and strilling a gold/olive CQ streamer. Stan on the water all day with Kenny and Andrea from the St. Charles area. Carolyn took their friends, Mark and Lisa from Wright City. Another great fly fishing day for Kenny and Andrea. They fished with Stan last November. Although they caught fish on several patterns, probably their best pattern was the size 16 insect green soft hackle (light olive). By the way, this was Kenny and Andrea’s birthdays. Happy birthday! 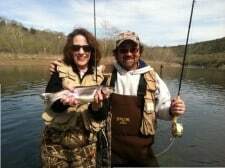 Carolyn’s couple, Mark and Lisa are pretty new to fly fishing so we started out working a bit on casting. Started out with the roll cast and progressed to the pick up and lay down cast. Good students! They did very well and finished up the bulk of the day catching lots of fish. Probably the best pattern was the size 18 ruby midge. Hooked a few on the insect green soft hackle, the holographic green crackleback and a primrose & pearl midge. For a while in the afternoon, Lisa just stood in one place above Trophy Run with a smile on her face catching fish. This entry was posted on Monday, April 15th, 2013 at 5:03 pm	and is filed under Fishing Reports. You can follow any responses to this entry through the RSS 2.0 feed. You can leave a response, or trackback from your own site.